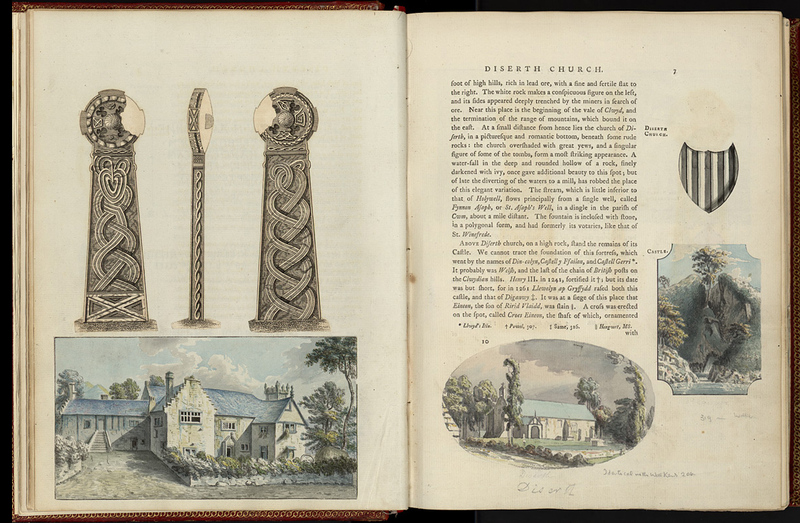 I first became aware of Thomas Pennant’s tours in Wales when working on the ‘Visual Culture of Wales’ project from 1999–2004, although this was initially through the work of Moses Griffith and the extra-illustrated volumes now in the National Library of Wales. Pages and illustrations from the volumes were used in the series of books and CD-ROMs by Peter Lord, which were published between 1998 and 2004. These extra-illustrated volumes are printed versions of the tours with large margins around the outside of the text. 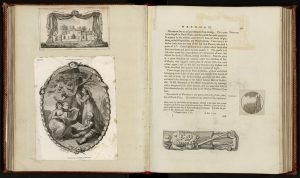 Their owners would have drawings added to these margins as illustrations, and used them rather like a scrapbook for additional prints and drawings, and also added larger illustrations, often in the form of prints, as additional leaves to the volumes. In this way the illustrations create an almost independent visual journey through Wales, and as each of the extra-illustrated volumes are unique, they are a reflection of their owners’ interests. 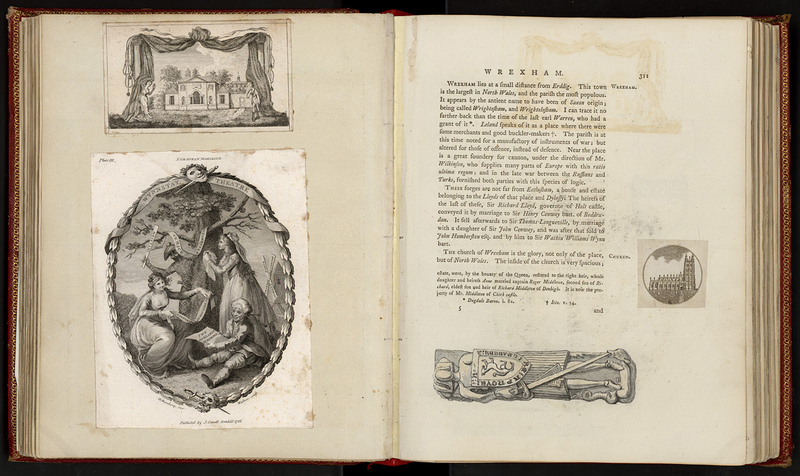 The images form a parallel narrative with Thomas Pennant’s text, which does not always describe the objects and views added in the outer margins. 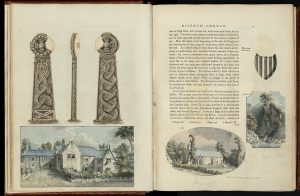 All of the National Library of Wales’ eight volumes of extra-illustrated are available on their website. These are thought to have been compiled for Thomas Pennant’s own library, although there is evidence that they reached their final form after his death in 1798. The volumes provide important evidence for buildings and artworks that no longer survive, or survive in an altered form. For example, medieval churches that were subsequently demolished or heavily restored during the course of the nineteenth century are found here. The National Library’s extra-illustrated volumes contain many of the earliest visual recordings of memorials, graveslabs, fonts and stained glass in Wales (as well as sections in Cheshire and Shropshire), and in some instances these are the only evidence that we have for these medieval artworks. For example, I found these volumes useful for their illustrations of medieval stained glass and used these sources when writing about medieval stained glass in Stained Glass from Welsh Churches (2014). I’ll try to add some examples to this blog in the coming months. Reviewing the posts by other artists on this blog so far, most seem to be responding to the landscape of the tours. My focus will mainly be on the built environment, and particularly the ecclesiastical history and visual culture of the churches encountered along the path of Thomas Pennant’s tours, which is represented primarily in the images that were added to the extra-illustrated tours. This entry was posted in Walkers' Blog on 15th July 2016 by Luca Guariento.